During obon, I headed to Hiroshima to do a little sake hunting and to visit Iwakuni for the first time. I had been to Hiroshima 3 times before so the trip would not be a special day for me. I admit that I enjoy watching Arashi variety programs, but mainly because most of them have interesting things to see. Watching “Arashi Ni Shiagare” is pretty cool because sometimes they have cool guests like Kousuke Kitajima (Olympic Swimmer) or Tsuyoshi Nagabuchi (Japanese Rock Legend). The week before I left for Hiroshima, they had a guest on “Himitsu No Arashi-chan”. The musical group Perfume who is from Hiroshima. They showcased several different mascots for the Hiroshima area, mostly non-famous ones, and they also showcased a lot of the omiyage (souvenirs) from the area. One omiyage that intrigued me was a grape dessert. 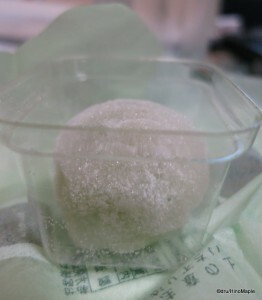 This dessert was a single grape selling for 250 yen each. A box of four sells for 1050 yen and it is a limited edition that is available only in the summer. I made it my mission to buy these grapes to see if they truly were as good as they said. The grapes are called “Hitotsubu no Muscat” and they are simple green grapes that have been candied. 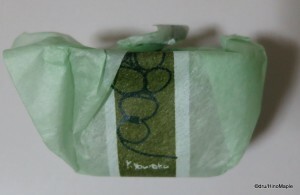 They are individually wrapped as any food gift in Japan is. I picked up two and got a little advice from the shop staff who told me that it was fine to keep it warm but that I should chill it before eating. I did so and it was a very interesting thing to eat. I tried to take a bite out of it rather than eat the entire grape. It just started to explode from the juices inside. The outside is covered in a sugar coating but inside it was as juicy as ever. I took the plunge and just popped the whole thing in my mouth. It was a delightful burst of flavour combined with the sugar. The combination of both the regular sugar and the sugars in the grape made it taste delightful. I can’t justify buying it all the time but a special treat once in a while is perfectly fine. I am not afraid to say that I bought into the commercialism that is present on TV, but at the same time when they show something that is good and it really is good, it is hard to deny that you can discover something good on TV in Japan. You may pay a price for it but you know it should taste good. However, I do draw the line at the 2000 yen per grape offering from the same company as that would be too expensive for me. Hitotsubu no Muscat is a product from the Kyorakudo Company that was started in 1933 in Hiroshima. This entry was posted in Chugoku Food and tagged Arashi, Arashi-chan, Arashichan, grape, Grapes, Himitsu no Arashi, Himitsu no Arashichan, Himitsuno Arashi, Himitsuno Arashi-chan, Himitsuno Arashichan, Hiroshima, Hiroshima-ken, Hitotsubu no Muskat, Kyorakudo, omiyage, perfume by Dru. Bookmark the permalink. What I miss most about South Africa: limitless space. What I miss second-most: cheap fruit, everywhere, every day. 🙁 I’ll never get used to what Japan does with/about fruit: primarily it’s not an everyday essential food item, it’s a hideously expensive present. This particular one sounds worth it, though, but I’m afraid I would never be able to stop after just one. My tooth’s too sweet! The good thing about this one, they do sell them individually. If you buy a small box, or just a couple, you can get home and then eat it. When you are done you are done. Just don’t consider ordering online or you might end up buying them all the time…. ….